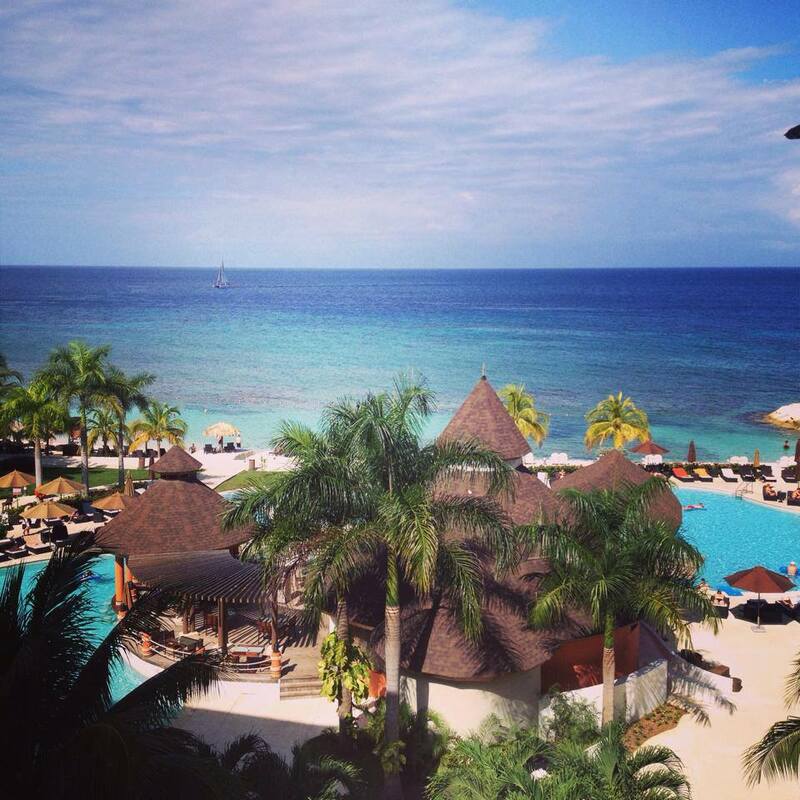 Relax and Rejuvenate in Paradise at Secrets Resorts! 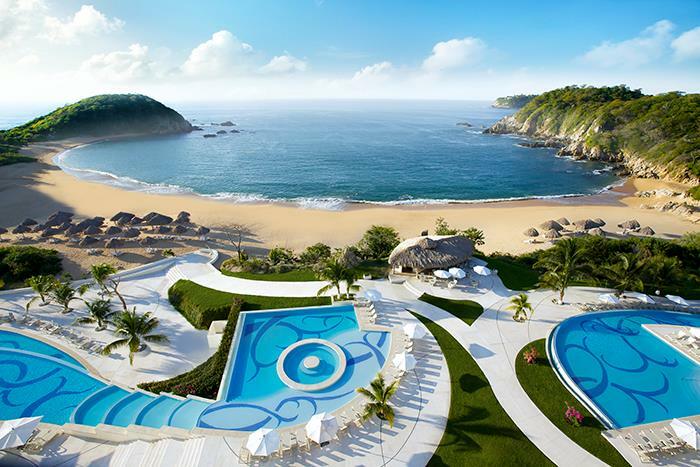 Happy #WellnessWednesday Secrets® Resorts & Spas fans! Imagine tranquility, serenity and relaxation in exquisite settings designed with you in mind. Our Secrets Spas by Pevonia are havens for rejuvenating body and facial treatments, soothing hydrotherapy, relaxing massage treatments and pampering salons; all here to treat you to an unforgettable spa experience. Read on to learn more about indulging in our world class spas! Relax & rejuvenate at Secrets Maroma Beach Riviera Cancun! 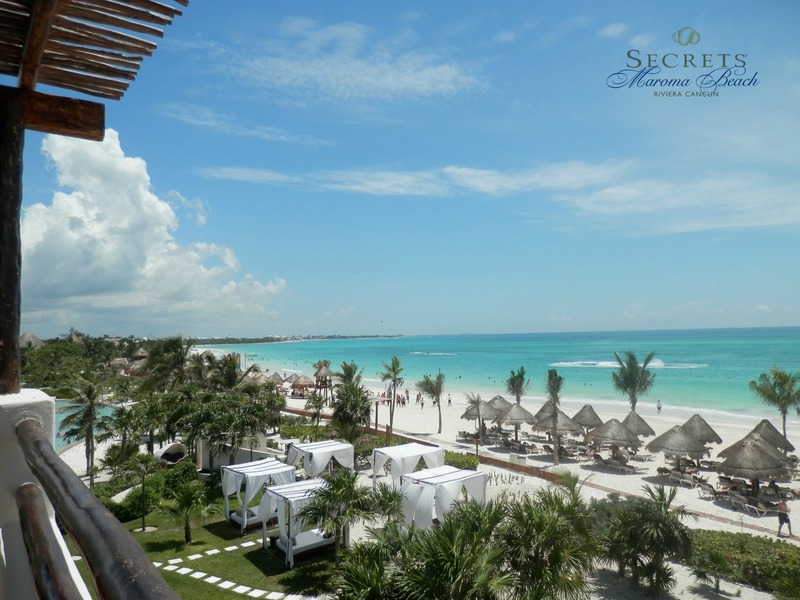 Today we’re shining a spotlight on two superstar Secrets Society members and their incredible vacation to Secrets Silversands Riviera Cancun! Tom and Linda D., two of our active and dedicated members of Secrets Society, recently cashed in on several rewards they earned by completing social media missions through Secrets Society. Together the couple was able to redeem their points for a romantic dinner on the beach and several spa credits. 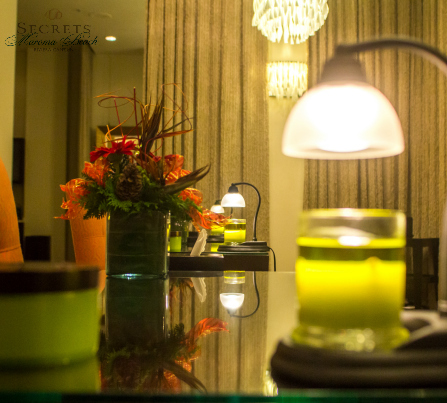 If you’re not familiar with Secrets Society yet, it is our online community of Secrets Resorts & Spas social media fans. 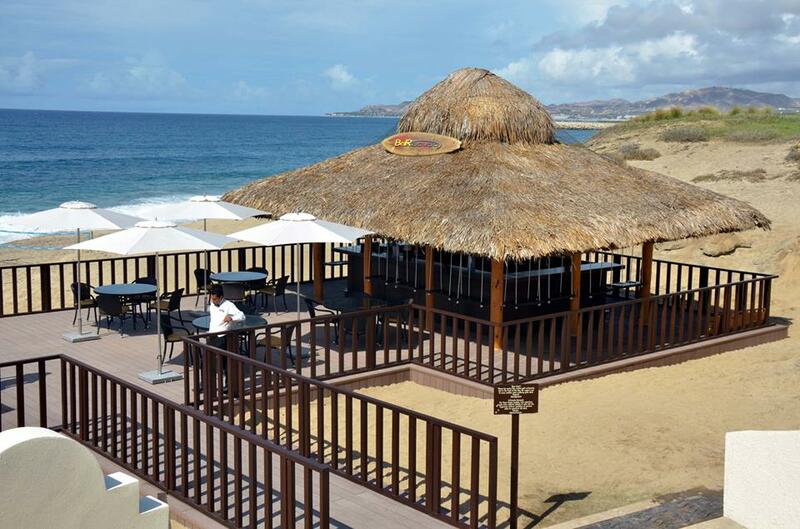 Secrets Society members complete social media missions in exchange for points toward free Secrets Resorts & Spas merchandise such as t-shirts and towels, as well as on-site rewards for your next vacation including credits to the spa and private romantic dinners! Keep reading for a sneak peek inside Tom and Linda’s vacation and the incredible rewards they redeemed at Secrets Silversands! Tom and Linda D. had an incredible vacation at Secrets Silversands Riviera Cancun! Win an Exotic Eco-Spa Vacation to Secrets Maroma Beach! Are you feeling lucky this #TravelTuesday? Secrets Maroma Riviera Cancun, Organic Spa Magazine and Pevonia Botanica Natural Skincare have teamed up to offer you a chance to win a luxurious Eco-Escape! 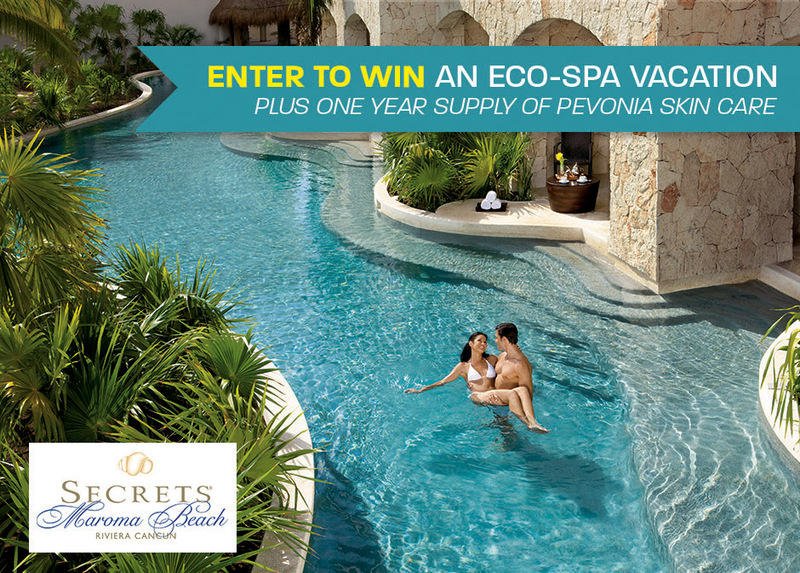 Enter to win an eco-spa vacation at Secrets Maroma Beach Riviera Cancun, plus a one year supply of Pevonia Skin Care! 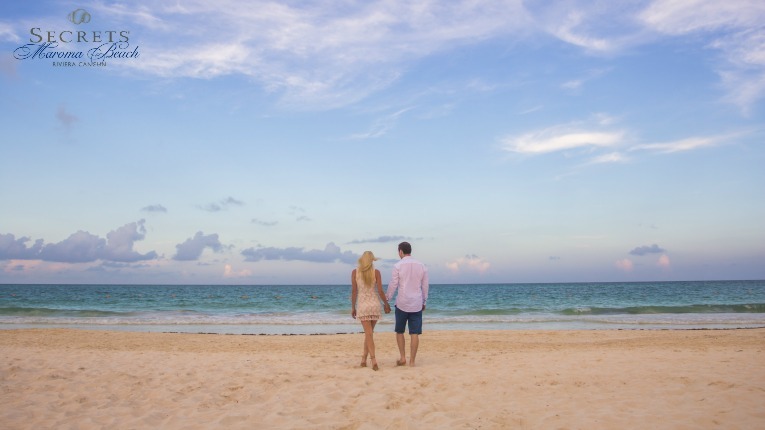 Our Top ‘Must Dos’ for a Romantic Getaway at Secrets Maroma Beach! 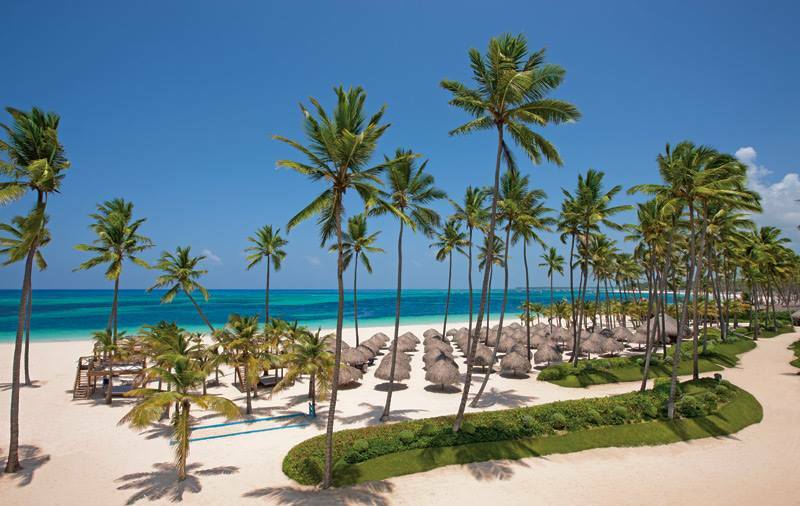 Tucked away on one of the most pristine and famous beaches in all of Mexico, Secrets Maroma Beach Riviera Cancun, a AAA Five Diamond Resort, is the perfect setting for adult adventure, relaxation, romance and Unlimited-Luxury®! Whether you’re spending time along the shoreline recognized as a ‘World’s Best Beach’ by the Travel Channel or enjoying 24-hour room service, limitless top-shelf spirits and pool and beach wait service – Secrets Maroma Beach is undoubtedly the perfect spot for your next romantic retreat. 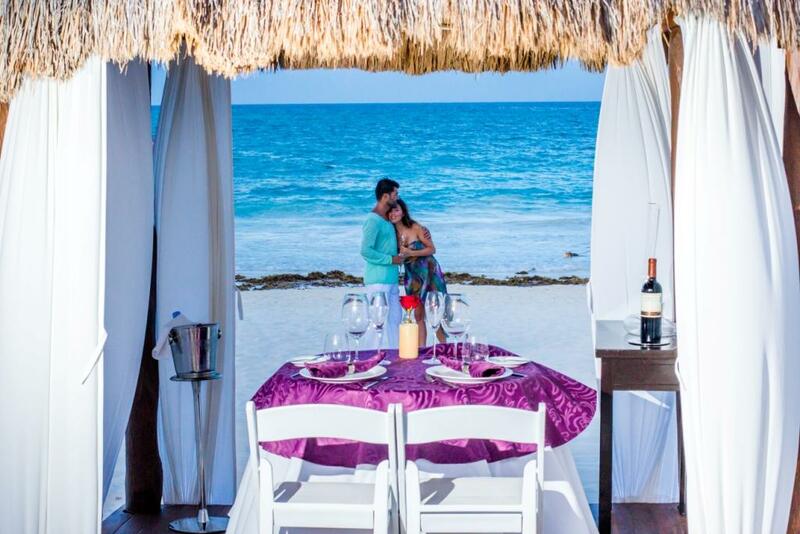 We can’t wait to share our top absolute ‘must dos’ for a romantic and memorable getaway at Secrets Maroma Beach! 1. Enjoy a relaxing, romantic morning of breakfast in bed! A gorgeous view for breakfast in bed from an Oceanfront Suite at Secrets Maroma Beach Riviera Cancun. What better way to enjoy a beautiful morning than by dining en-suite with your significant other? Secrets Maroma Beach offers 24-hour en-suite room service to all of our 412 luxurious guest suites, each featuring a four-poster canopy king-size bed (or two double beds), private terrace or balcony and in-suite Jacuzzi for two. 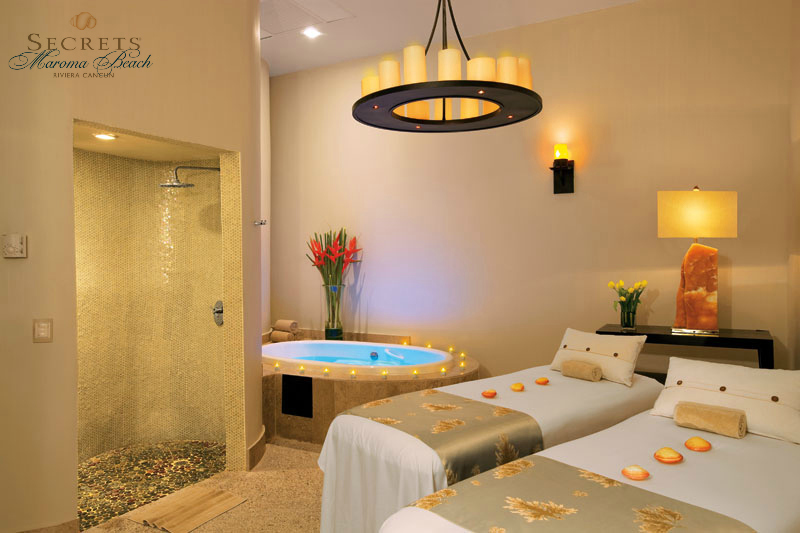 A couples massage treatment room at Secrets Maroma Beach Riviera Cancun. Spanning over 13,000 square feet, the magnificent Secrets Spa by Pevonia treats you with dozens of pampering choices. Experience pure indulgence through a combination of the latest hydrotherapy and a wide variety of treatments. We recommend sharing a relaxing couples massage! A romantic dinner on the beach at Secrets Maroma Beach Riviera Cancun. At Secrets Maroma Beach, you can indulge in an expansive array of international cuisine. Choose from seven á la carte gourmet restaurants, a buffet venue, a café and more – reservations are never required. Or, for a special, intimate option: sneak away for a romantic meal on the beach! 4. Enjoy a complimentary package! A couple enjoys a romantic moment on the beach at Secrets Maroma Beach Riviera Cancun. Are you a newlywed or perhaps celebrating an anniversary? Simply request our newlywed or anniversary package at time of booking and bring along a copy of your wedding invitation or marriage certificate to present at check-in. Couples will be treated to a welcome letter, fresh fruit, a bottle of sparkling wine, special turn-down service, a romantic breakfast in bed with mimosas and a 15% discount on all spa treatments – all complimentary! From the moment you wake in your sun-soaked suite, your days and nights are filled with nearly endless opportunities for reconnecting and romance! Ready to book your next getaway? Act fast! Now through April 30, the longer you stay the more you save with our Unlimited Air Credit offer! Get $50 air credit per room, per night when you reserve your stay at any Secrets Resort & Spa by April 30, 2015 for travel from February 25, 2015 to August 21, 2015. Plus, receive up to $400 in resort coupons. At Secrets Resorts & Spas, your massage comes with a beautiful view! The Secrets Resorts & Spas Spa by Pevonia will leave you feeling truly refreshed. Let the warm waters of the Secrets Resorts & Spas Spa by Pevonia wash away all your worries. We invite you to come indulge your senses and experience 105 minutes of euphoria in an atmosphere of complete relaxation. After your Secrets spa day, you will feel completely refreshed, invigorated and ready to take on 2015. This year, pamper yourself at Secrets Resorts & Spas. You deserve it. Book your spa day today! 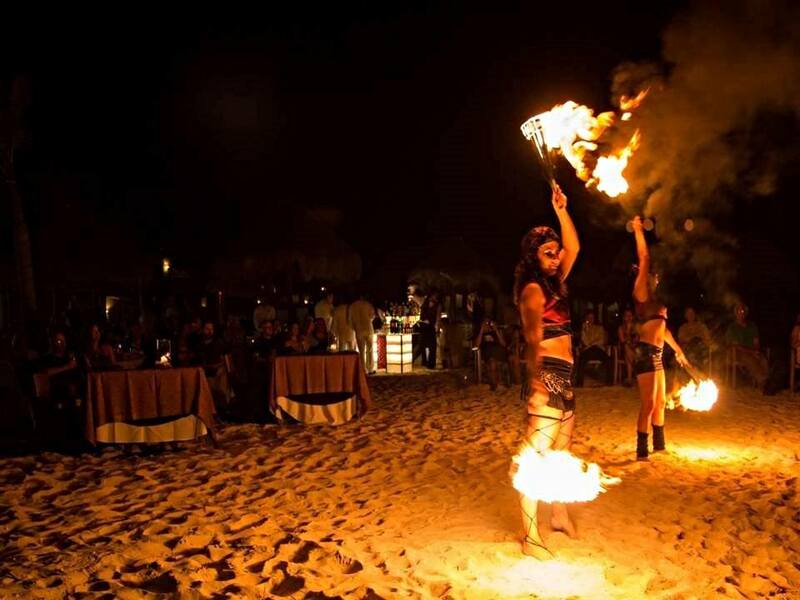 Today on the blog we have the pleasure of featuring a guest blog post by the Secrets Maroma Beach Riviera Cancun e-concierge, Romina Pizzuti! 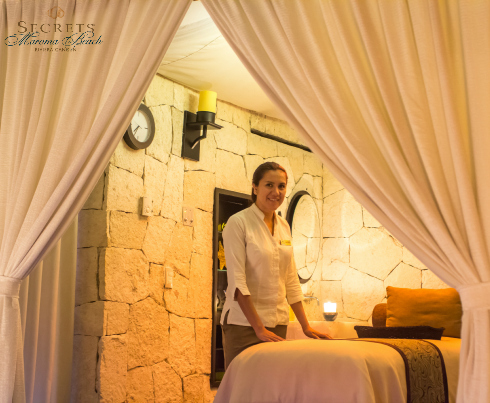 Romina wrote about her fabulous and well-deserved spa day at the Secrets Maroma Spa by Pevonia. 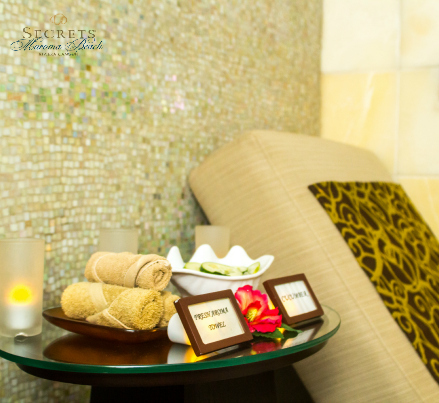 Read on to learn all about Romina’s spa experiences! 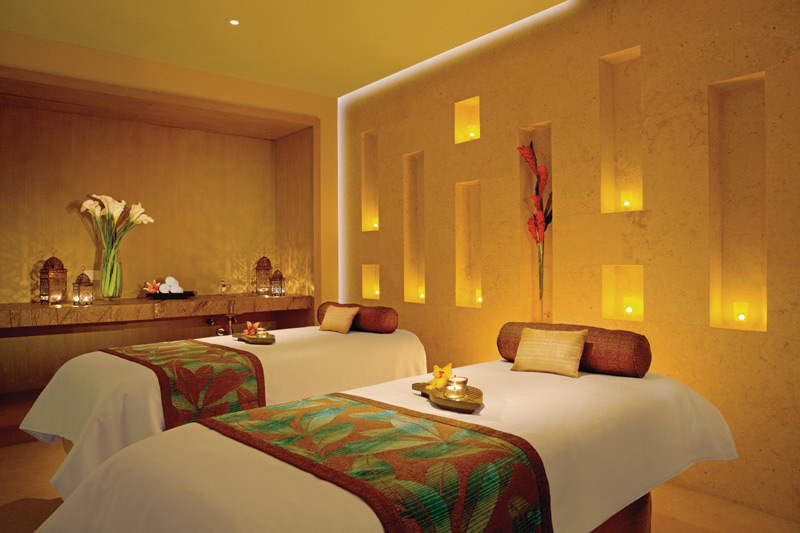 Every detail is picture-perfect at the Secrets Maroma Spa by Pevonia. “A lot of people talk about our resort–the beach, food, entertainment, staff, etc.—and how great everything is during their stay. As employees that have the pleasure of interacting with guests on a daily basis, we are lucky to occasionally get the opportunity to try out some of the services offered ourselves! 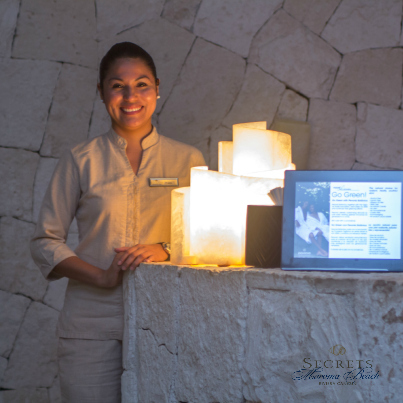 Our spa staff is always there to guide you through your day of pampering relaxation. 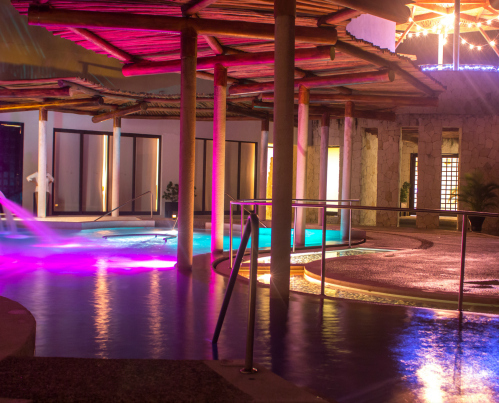 This was the time for me to try our Secrets Maroma Spa by Pevonia, and I wanted to experience the facilities the same way our guests do. When I arrived at the spa, I was immediately greeted by Martha and Carla (both of them with huge smiles on their faces), and guided to the Hydrotherapy Circuit. I learned that this type of treatment is good for relaxation and to maintain a person’s state of health. Hydrotherapy is also excellent for reducing or relieving sudden or long-lasting pain. Hydrotherapy can work wonders for every body! After an hour of complete relaxation, the spa valet came to take me back so I could take a quick shower, where I treated myself to some of the Pevonia products they have there to sample. Next I was off to the Relaxation Room. She fixed me up a flavored tea and gave me a hot pillow for my neck (oh what a delight that was!). Gabriela, the therapist, entered the room and asked me if I was ready… Was I? Of course I was! She took me to a single cabin and began with a Swedish Massage. I must say, I have had that type of massage before, but her hands were extra soft! Everything was just perfect! Gabriela prepares for Romina’s massage treatments. I felt the tension release as soon as she started the massage; working in an office all day can make your muscles a little stiff. She then explained to me how important it is for everyone to get massages for their health, the different types of massages and how they make recommendations depending on the client’s needs. I am tempted to try the reflexology or aromatherapy massages next. After she was done with my massage, it was time for my facial. She evaluated my skin and recommended an Elasto Firm Facial, which was very soothing and contains Marine Collagen and Marine Elastin to help with skin’s firming, toning and hydration. Gabriela explained that Pevonia Botanica was the first company to develop a spa skincare line exclusively for elite spas and professional aestheticians and that the products are made of natural ingredients. They have a variety of products to offer and one of her favorites is the Intensifier Collagen & Myoxy Caviar. Everything is perfect from check-in to check-out! After a gentle facial massage, my wonderful Spa Day was over. I left the Spa completely satisfied and relaxed; it actually put me in a different mood! As I was walking out the door, I saw a bride getting ready for her big day. I asked her how she was feeling, and even though she was a little nervous, she mentioned that the staff helped calm her down. The staff members all have so much experience with brides and understand how important it is for everything to go perfectly. I complimented her hairdo, which was fabulous, and off I went. Friendly faces make the Spa by Pevonia feel like home. If this sounds like heaven to you, be sure to book yourself at Spa Day at the Secrets Maroma Spa by Pevonia during your stay! We can’t wait to see you!